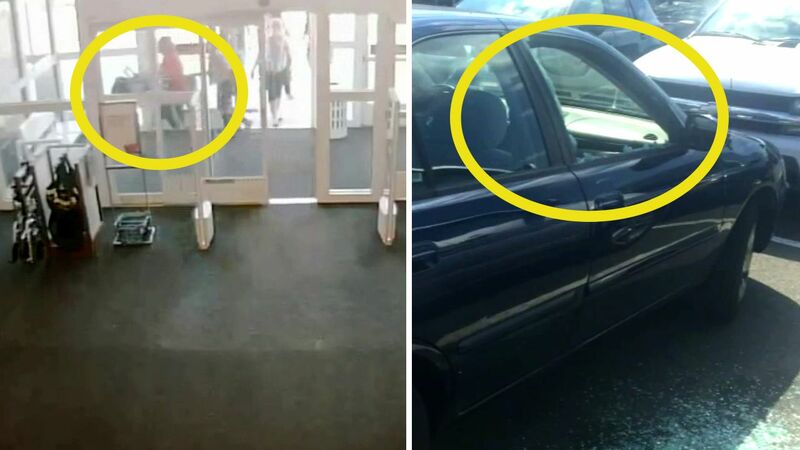 HOWELL TOWNSHIP, New Jersey (WABC) -- Surveillance video shows a Good Samaritan rushing a distressed baby left in a hot car into a department store in New Jersey earlier this week. Sara Mazzone heard the crying 4-month-old girl in a car parked in the Kohl's lot in Howell Township Monday just before 1 p.m. She went to check it out, and found the girl strapped into a car seat under a blanket inside a locked car with the windows rolled up all of the way. "It was screaming, hands were out sweating," said Steve Eckel, a retired police officer who came over to help after seeing Mazzone start to panic. At first, he was reluctant to break the glass, but the situation got worse by the minute. "Breathing quickly, hyperventilating, and clearly in distress," Mazzone said. So Eckel got a sledgehammer he had in his car and used it to break the window. Watch surveillance video from Kohls that shows a Good Samaritan bring a hot baby into the store. The two Good Samaritans said they're glad the baby is OK.
After police arrived at the scene, Eckel said the baby's mother emerged and asked, "Where's my baby?" Officers charged her -- 33-year-old Karen Gruen -- with endangering the welfare of a child.